After over 36 hours of bus travel from Buenos Aires to Río Gallegos, a small town on the south of the Argentinian Patagonia, I’m a bit disoriented. Still, I’m quick enough to get on the next bus departing to El Calafate, I just want to get out fast. Río Gallegos looks like how I imagine Chernobyl must be like. When I finally arrive to the more upscale town of El Calafate, I leave my things at the first hostel I find and set out to look for a tour operator that’d take me to Perito Moreno; my only reason for being here. 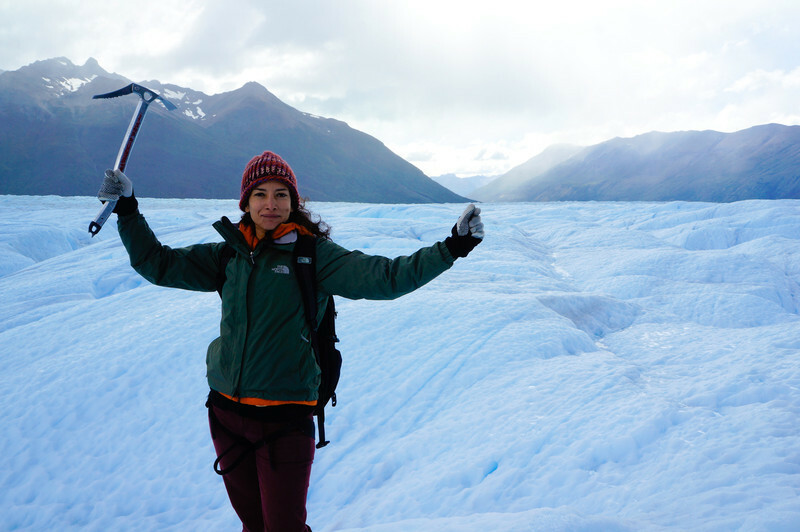 There are different ways to explore the Perito Moreno glacier, but I am dead set on doing the long ice trek. It turns out that there’s only one operator that offers this sort of trip; so there’s no room for choosing or bargaining, they have a monopoly on this one. The price of the tour covers transport, guides, and gear. The next morning, before sunrise, I’m the first person to be picked up with the bus. Slowly we make our way through El Calafate and the bus fills up. We end up being quite a big group, 36 people in total. I ask our guide if we’re all doing the long trek, he answers with a nod. I’m surprised to learn this, mainly because they make you sign a disclaimer when you book the tour and they ask about several health conditions; I thought that’d turn off a lot of people. There are some clouds in the sky and it’s even drizzling a bit, we hope it doesn’t morph into full on rain. At the park’s entrance, most of us have to pay the 130 admittance fee to Los Glaciares National Park, a UNESCO World Heritage Site. I was disappointed to learn that my Colombian nationality does not earn me the MercoSur discounted rate. The Perito Moreno is actually the third biggest glacier in Los Glaciares NP; the biggest is the Viedma Glacier, followed by Upsala Glacier. Also, this area has the third largest ice cap in the world, after Antarctica and Greenland. 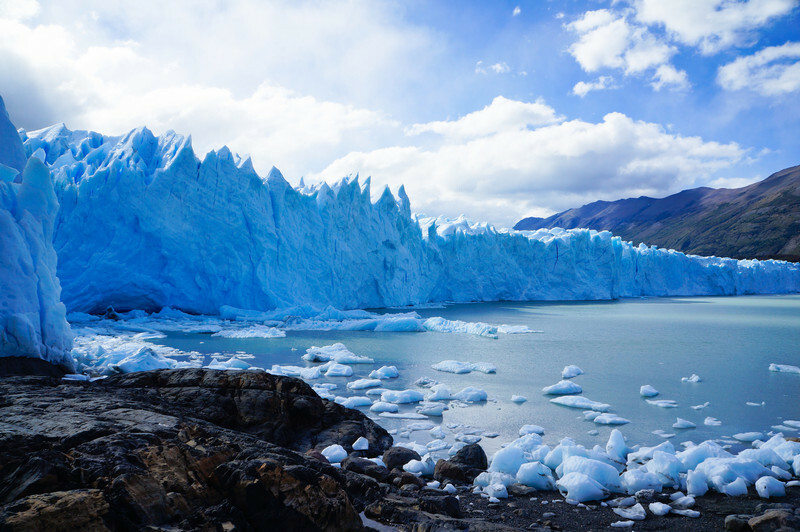 Our first stop, are the viewing walkways in front of this huge ice wall that stands 74 meters in average above the waters of Lake Argentino. We are one of the first groups to arrive, so they are practically empty. We walk around for 45 minutes trying to get photos from every possible angle. Then we get back on the bus and they take us to the port so that we can cross to the other side by boat. After we get there, we’re split into 3 groups, each with 2 guides; and we start hiking on the side of the glacier for about 30 – 45 minutes. It’s a really mild hike without many steep climbs. When we get to the campsite, they give us a set of crampons and a harness. 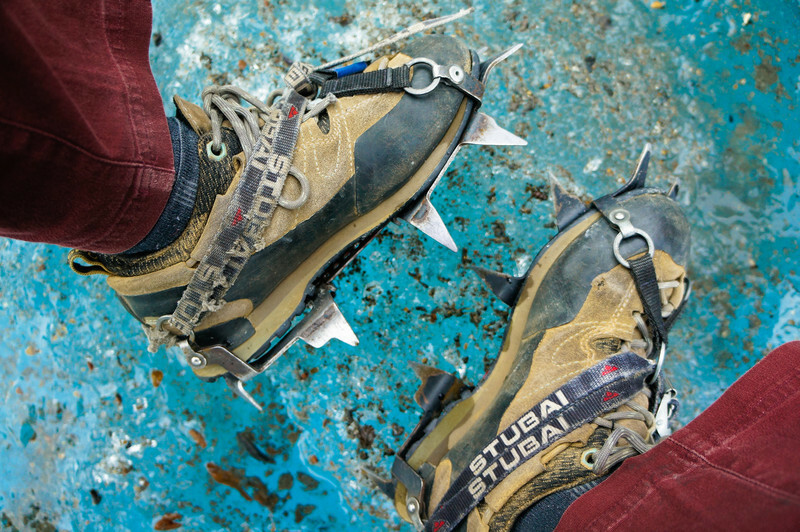 This is only my second time wearing crampons. The first time was when I tried to climb Wedge with Alain in Canada. The trek on the ice field lasts for about 4 hours, we walk in a line, one behind the other to avoid dangerous things like crevasses and the like. In general, I found the trek to be quite mild and not really challenging as most of the surface was flat. Whenever it got to be a bit steep the guides would used their ice axes to make it easier for us. So I found all the warnings about being in top shape to do this excursions are a bit of an exaggeration. Heck, in my group, there were people who didn’t have proper gear and they had no problems at all completing this walk! 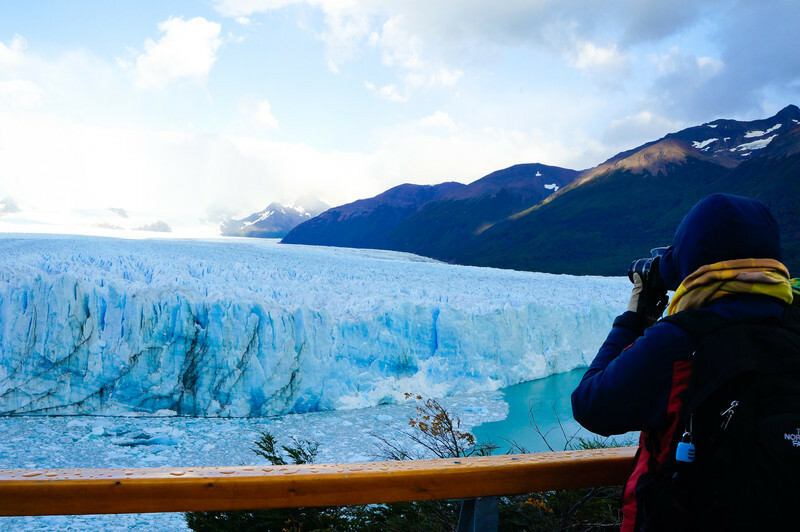 In the end, getting so close to the Perito Moreno glacier was an unforgettable experience. I really loved the intense blue hues of the ice and the views of this extreme landscape. However, in my opinion, the ice trek tour is a bit overpriced and if I were to do this again; I’d check how the tours to the bigger glaciers, the Viedma and the Upsala, compare. Below, I’ve included a short clip of the end of the trek so you get a better idea of what it felt like. Also, if you’d like to see the rest of my photos from the Perito Moreno glacier, visit my gallery. Have you visited any glaciers during your travels? Where was your favourite and why? Leave a comment and let me know! Impressive! Love the photo of you on the glacier! Wow, looks amazing! I love the bright blue colour! Yes, Tammy! 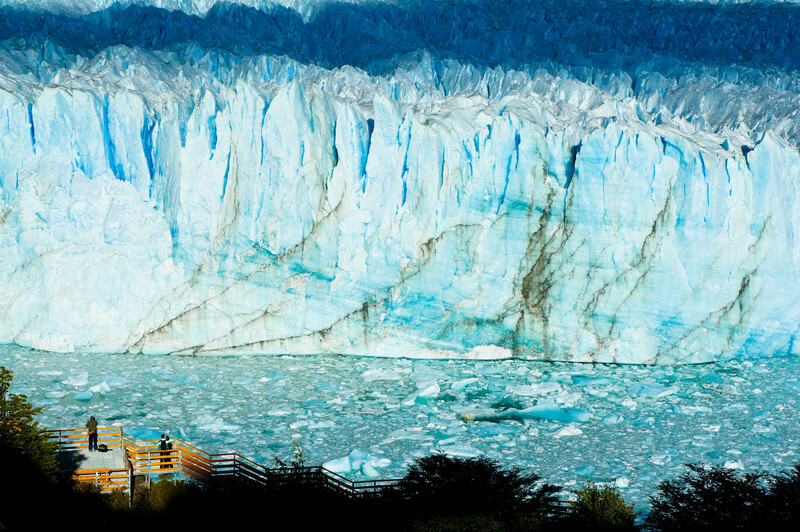 The Perito Moreno is unforgettable… The colours and the sheer size of it are very impressive.